Yorkhill confirmed himself one of the season's leading novice hurdlers today, but he proved an awkward ride for jockey Paul Townend, who was deputising for the horse's regular rider, Ruby Walsh, who is injured. Trainer Willie Mullins, who was pocketing another handy sum towards his British champion trainers' title challenge, could take comfort from the fact that while Yorkhill pulled too hard for his own good he won despite wasting energy and throwing in some tardy jumps. The six-year-old, the 30/100 favourite, carried the colours of Andrea & Graham Wylie and won by two and a quarter lengths from Le Prezien, trained by Paul Nicholls. Mullins said: "Paul [Townend] had a horrible ride - I think we'll put a different nose band on the horse next time. He was just too free and there were not enough other horses in the race to give him cover. I was amazed that after pulling so hard and making a mistake at the last he still won. He must have a huge engine. "He's bred to get three miles, yet he was able to do that [over two and a half miles]. He looks Champion Hurdle material, yet he could easily go novice chasing next season - it's a hard one. We'd rather go Champion Hurdle or Arkle Trophy, than World Hurdle, and when Ruby got off him after winning at Cheltenham he said, 'this horse could win the Arkle with his mouth open'. "It's nice to win some more prize money, but reading one paper this morning I noticed that Nicky Henderson could win the National and beat both me and Paul. So far everything is going well, so fingers crossed for the rest of the day." Mullins has another ace in Douvan, who runs in the next race, the Doom Bar Maghull Novices' Chase. Million In Mind's Le Prezien looks set to make a premium when going under the hammer at Doncaster sales next month after finishing a good second to Yorkhill. The 8/1 chance was beaten by two and a quarter lengths. Million In Mind's syndicates are dispersed annually at the Doncaster May Sales. Bloodstock agent David Minton, who manages the syndicate, said: "We are not going to Ayr, we are going to the sales next. I would hope he would make £250,000-£300,000. 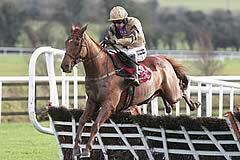 If a point-to-pointer can make £335,000 (Samcro, who sold at Aintree on Thursday evening), he has a chance." Trainer Paul Nicholls added: "The winner had a bit of a freebie up the straight having been keen but we weren't really expecting to beat him to be honest, so we are very pleased with Le Prezien. He is off to the sales now." Sam Twiston-Davies, rider of Le Prezien, added: "The winner must be impressive because he did a lot wrong - running free and wandering. It was disappointing - I thought we had a chance of beating Yorkhill but we still ran a very solid race. He goes to the sales and I imagine he will be very expensive." Third-placed Flying Angel (15/2), who was a length and a half further behind, is set to go novice chasing next season. "We're very pleased, everything went to plan in the race although I thought the winner might take him out at one stage!," said trainer Nigel Twiston-Davies. "That's it for this season. He's a big horse and he'll be going over fences next season."